Nephelium. (From Malay Rambut, hairs). Sapinidaceae. Evergreen tree to 24m, in cultivation 14m. Leaves alternate, pinnate, 10-30cm; leaflets 3-11, 5-15cm wide, dull green, margins entire. Flowers 2.5-5mm, apetalous, discoidal, perfect but functionally staminate or pistillate, bourne in erect terminal panicles, 10-30cm. 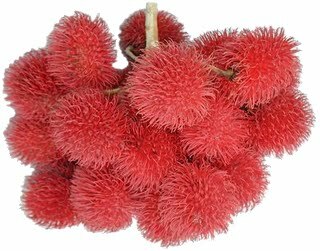 Fruit an ovoid drupe 3-6cm occasionally 8cm, 10-20 bourne in loose clusters, flesh translucent; whitish to pale pink; sweet, mild acidity. Skin leathery, red; occasionally orange to yellow, covered in fleshy spines. Seed 1, shiny brown, 2-3cm with pale basal scar; slightly poisonous as they contain a trace alkaloid, but can be cooked and eaten. In warm tropical zones, cultivated primarily for its fruit which is commercially produced within 15º of the equator, from sea level to around 550m elevation. Temperature sensitive so must preferably be kept above 10ºC; temperatures below 5ºC may cause defoliation and occasionally death of trees. Requires deep soil, high in organic matter, low pH and well-drained. Propagated by grafting (the most common method), air layering or budding. Trees produced from budding may fruit at around 2-3 years; optimum production at 8-10 years. Seed loses viability quickly, and must not be allowed to dry out before planting. Washed seeds may be stored in charcoal, moist sawdust or sphagnum moss for up to 3-4 weeks and have even been known to sprout in storage. For best results seeds should be planted horizontally, with the flat side downmost to facilitate straight upward growth and a strong root system. Germination takes 10-14 days. Trees grown from seed fruit well at around 5-6 years. A mature tree can produce around 90kg of fruit per year. Fruit matures from July to October, and from November to January for a second harvest. Once done, the soil can be replenished by the application of a complete fertiliser with the use of ammonium sulphate around 1kg per tree after harvest and again at the end of the rainy season. Nitrogen 15kg/ha, potassium 11-12kg/ha, phosphorus 2kg/ha, magnesium 2.5-3kg/ha and calcium 6kg/ha may also be applied as needed. Irrigation should only be needed during dry periods. Pruning is also beneficial as it not only keeps trees in good condition, providing good air circulation particularly in the tree’s centre thus reducing the possibility of rot and other damp induced diseases, but also maintains the strength of the trees which may be damaged by strong winds; shelter is recommended. Trees may be attacked by leaf-eating insects such as the giant bug (Tessaratoma longicorne) and mealybug (Pseudococcus lilacinus) as well as the mango twig-borer (Niphonoclea albata). Other pathogens such as powdery mildew (Oidium species) may cause damage to leaves. These can all be controlled by periodic applications of a proprietory spray as needed. Stem canker Fomes lignosus, (Philippines) and Ophioceras species (Malaya), can be fatal and must be controlled from the start. There are over 150 cultivars available. Recommended: ‘Binjai’ (Indonesia): red skin, firm fruit, elongated, sweet, large size. ‘Chai Tow Cheng’ (Malaysia): red skin, elongated, sweet, large size. ‘Daun Hijau’ (Malaysia): red/orange skin, elongated, sweet, large size. ‘Gula Batu’ (Malaysia): red, round, medium size. ‘Jitlee’ (Singapore): red skin, keeps well, medium size. ‘Muar Gadang’ (Malaysia): yellow, round, large size. ‘Rongrien’ (Thailand): red skin with pliable green spines, sweet, large size. Other named varieties include: ‘Governor Infantada’: flesh thick, sweet/sharp, juicy, elongated, clingstone, very large size. ‘Magsaysay’: very dark red/black skin, flesh thick, elongated, sweet and juicy, freestone, large size. ‘Princess Caroline’: dark red skin, flesh thick, small size. ‘Queen Zaida’: dark red skin, flesh thick, elongated, sweet and juicy, freestone, medium size. 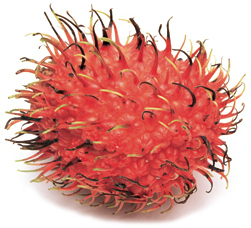 ‘Quezon’: yellow/red skin, flesh thick, sweet/sharp, juicy, small/medium size. ‘Quirino’: yellow skin, flesh thick, sweet and juicy, small size. ‘Roxas’: dark red skin, flesh thick, sweet and juicy, clingstone, medium size. ‘Santo Tomas’: yellow/pink to red skin, flesh thick, round. ‘Victoria’: thick yellow skin, flesh thick, sweet and juicy, freestone. ‘Zamora’: yellow skin, flesh thick, elongated, sweet and juicy, small size. 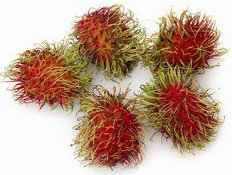 Rambutan fruit is best consumed fresh but can also be stewed as a dessert, canned in syrup and processed into preserves. More recent recipe developments suggest an affinity with such comparatively delicate flavours like good quality vanilla ice cream, fromage frais and similar light dairy-based desserts.